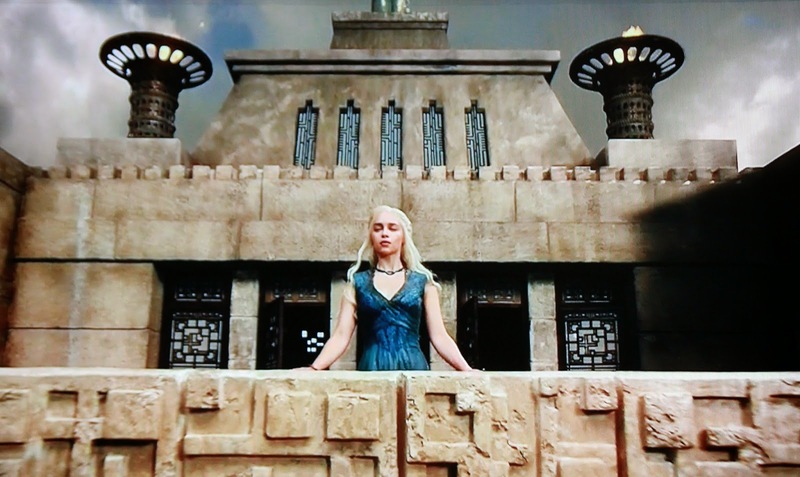 Update: In HBO's Game of Thrones, guess whose influence, via a specific design, showed up in Meereen? 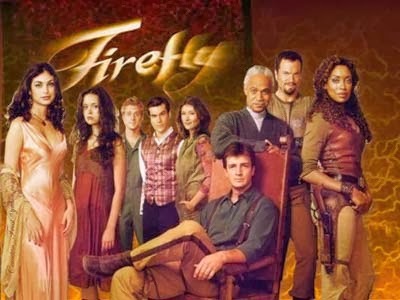 Firefly was the American space western television (2002) that obtained a vast following, despite being cancelled after only 11 of the 15 produced episodes. 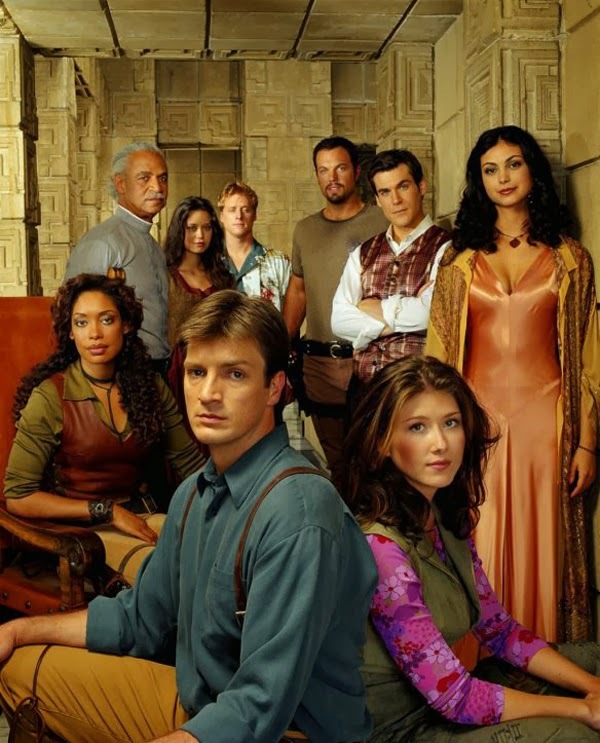 It followed with a film, Serenity in 2005. 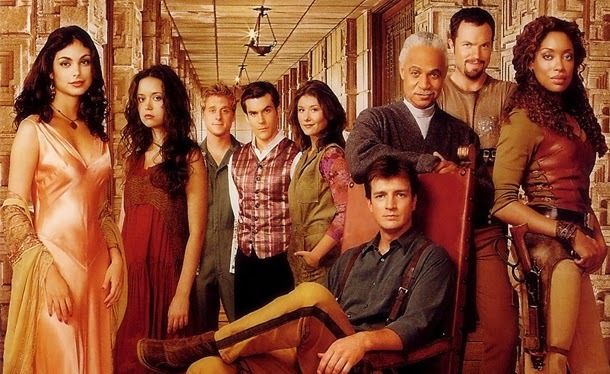 As can be seen here, the Ennis House served as the backdrop of their publicity shots, via massive photoshopping. 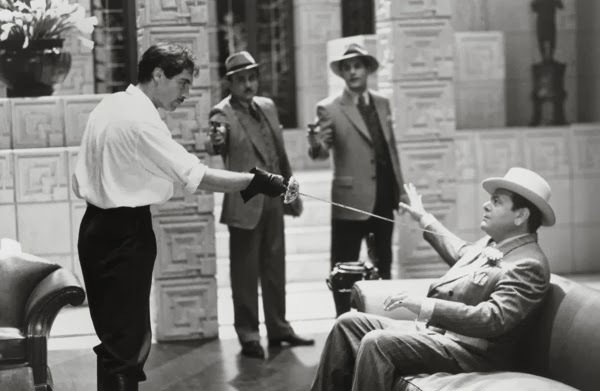 Frank Lloyd Wright's Ennis House has been used by Hollywood filmmakers for decades. 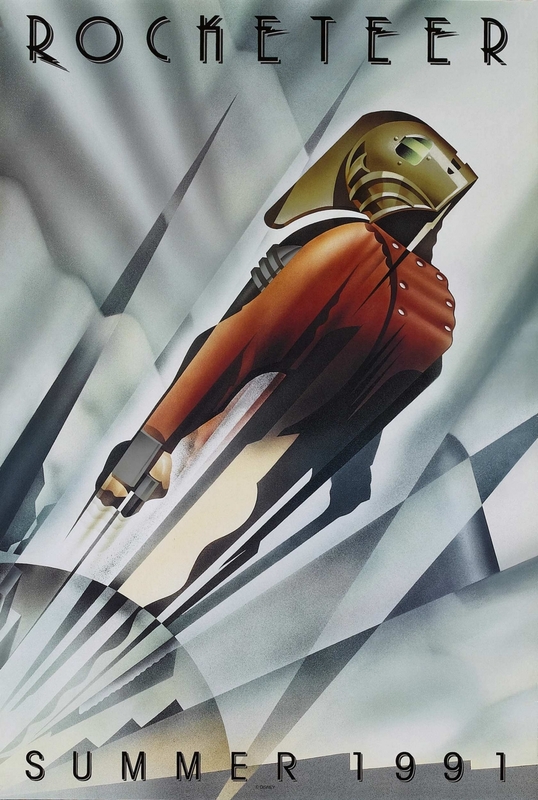 The house's design and textiles inspired synchromystic scenes in Mulholland Drive, The Rocketeer, House on Haunted Hill, Buffy the Vampire Slayer, Predator 2, Beverly Hills Cop II, and most importantly, Blade Runner. 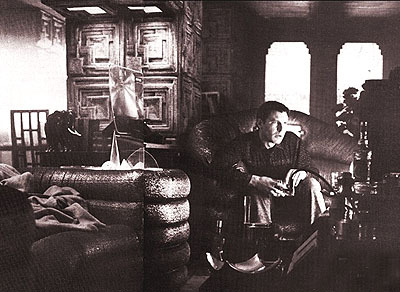 David Lynch filmed his fictional soap opera, Invitation to Love, within Twin Peaks, within the Ennis House. 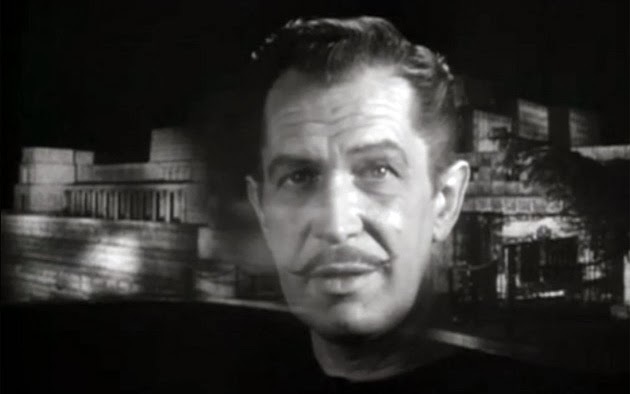 The Ennis House and Vincent Price appeared in House on Haunted Hill. 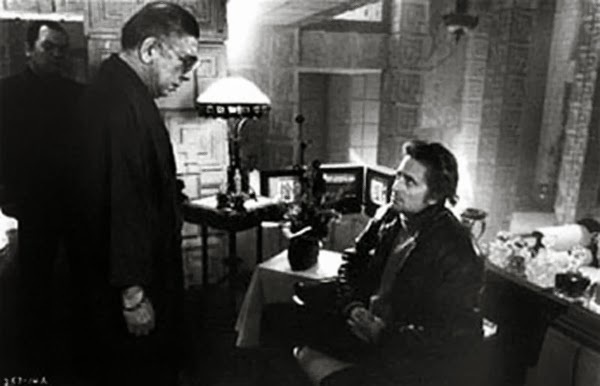 Michael Douglas' 1989 yakuza movie Black Rain also used the Ennis House. Source. On February 25, 2014, Department of Art and Art History at St. Mary's College of Maryland's Scott Frank, Ph. D., gave a lecture entitled "Dreams and Realities of Frank Lloyd Wright: An Examination of Los Angeles' Charles Ennis House." 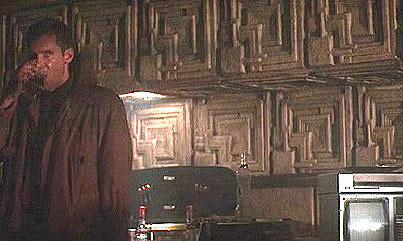 "As a way to explore these issues, Dr. Frank will focus on Wright's Charles Ennis House, located in Los Angeles, which has been a residence, an historic building, and has also served as the location for over eighty screen appearances for TV, music videos, and several films including Blade Runner (1982), Rush Hour (1995), and Firefly (2005). Source. 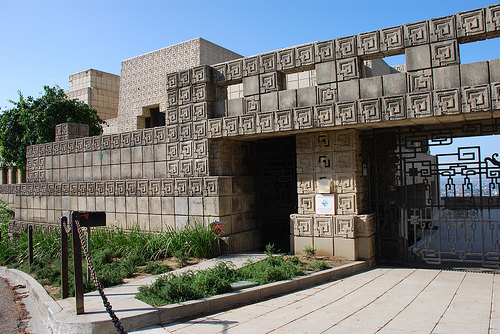 The Ennis House has been estimated to be worth in the $14 million range. But why spend that much if you want your own copy of it? On March 1, 2014, it was announced by InFocusTech that they have produced an exacting replica of FLW's Ennis House. 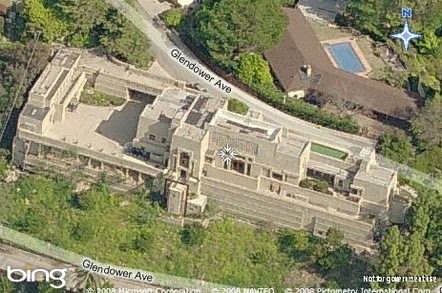 Ennis House is located at 2607 Glendower Ave in Los Angeles and was completed in 1924. This building was designed by Frank Lloyd Wright and represents Mayan revival architecture. This pewter replica’s base measures 5-1/4 inches by 2-7/8 inches and is finished in antique pewter. 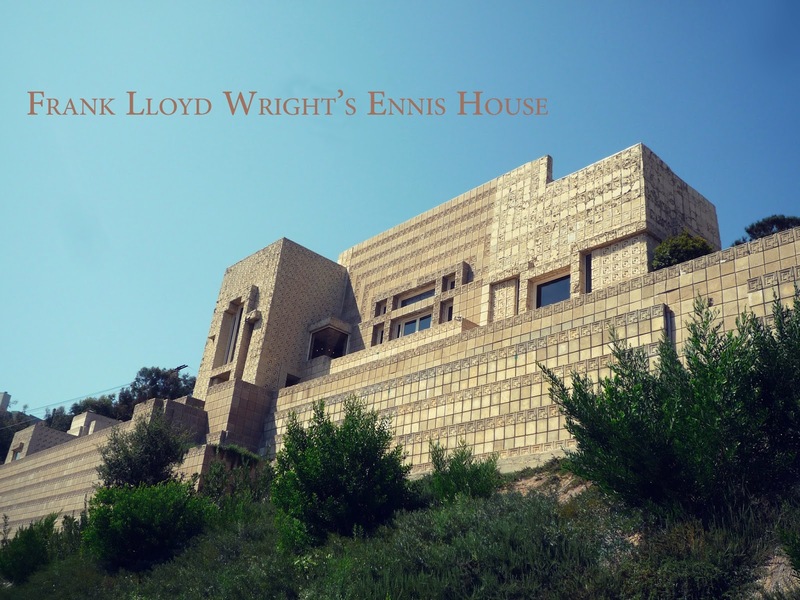 The Frank Lloyd Wright-designed Ennis House was formerly called the Ennis-Brown House. Although originally and currently known as the Ennis House, the building was long known as the Ennis-Brown House. This became its name in 1980 when it was renamed in appreciation of its donation to the Trust for Preservation of Cultural Heritage by Augustus O. Brown, the eighth owner from 1968–1980. 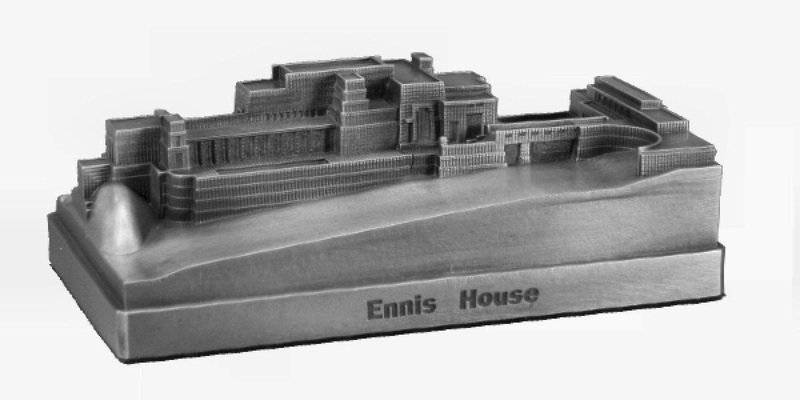 In August 2005, the house was returned to its original name, and the Trust for Preservation of Cultural Heritage was renamed the Ennis House Foundation. Deckard's apartment, drawn by set designer Charles William Breen and built on stage at Warner Brothers, was absolutely and directly inspired by the Frank Lloyd Wright-designed Ennis House. Breen actually had plaster casts taken from the textile blocks of the Wright-designed house and used them for the walls in the stage set. In 1999, during shooting, movie director David Lynch created the Club Silencio as a location in his surreal classic Mulholland Drive (2001). 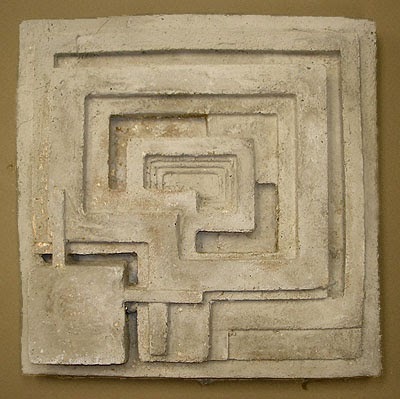 Tile casts of the block relief ornamentation from Frank Lloyd Wright's Ennis House were used for the Club Silencio doorframe. In 2011, Lynch opened a real-life nightclub in Paris named Club Silencio, inspired by the one in his film. 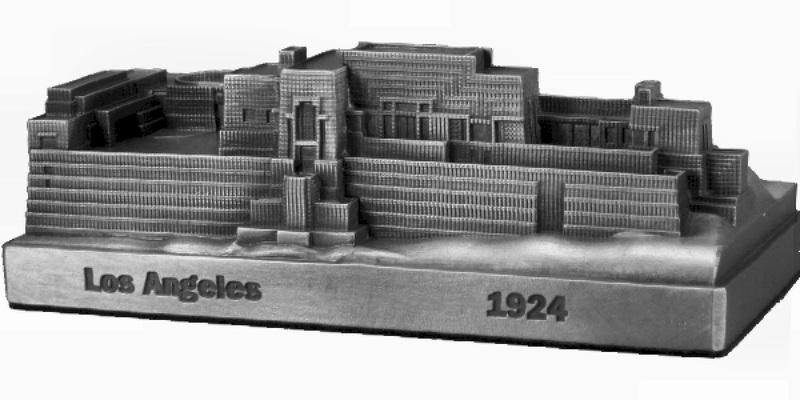 Wright designed the Ennis House in 1923, and built it in 1924. 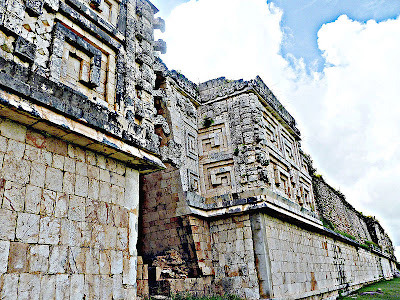 He based the relief ornamentation on its textile blocks, inspired by the symmetrical reliefs of the Mayan buildings at Uxmal. 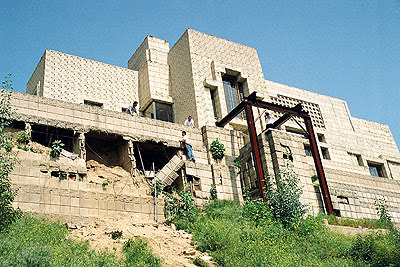 The Ennis House was in shambles before the 2007 restoration began. 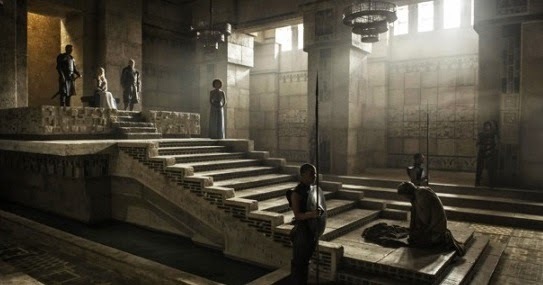 More on the David Lynch use of the Ennis House (below) for his filming of the internal soap opera, Invitation to Love, in Twin Peaks, see here. The Ennis-Brown House was used for exerior shots in the William Castle (born 'Schloss' = 'castle') movie House on Haunted Hill. It featured an eccentric millionaire named Frederick Loren (played by Vincent Price), a death by hanging (the incredibly beautiful Carol Ohmart), a decapitation, an acid pit, and various morbid touches, including dripping bloodstain on the ceiling, guests arriving for a party in funeral cars, a little row of coffins containing guns, and lots of ghosts. 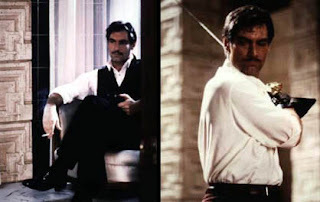 A remake appeared in 1999 but they didn't use a Wright house....William Castle, incidentally leads to Rosemary's Baby (he produced the movie), which leads to the Dakota, which leads to John Lennon's murder, and who knows where else? Below is a replica of the Dakota. As with the Ennis House replica, if you end up ordering the Dakota, do mention "Loren Coleman" in the comment section. Thank you. For more about the history of the Dakota, see here.